Do you remember the song, Friends are Friends Forever? I wonder how many of us heard that and just knew that would be how it was with certain friends. Forever. Easy. 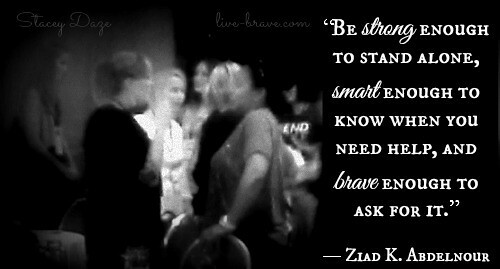 But friendship actually takes bravery. Bravery to be vulnerable, bravery to accept change, and bravery to release. I’m no expert on relationships, but these are a few things I have learned. (1) We have to be brave to release our expectations of forever and embrace the person now. It’s not that a friendship can’t last a long time, but it will never last a long time in the same way. There will be seasons when you have to be fully present elsewhere, and if a friend expects you to always meet for coffee on Tuesdays at 3, they will be sorrowfully disappointed. If we want the friendship to continue then we have to be aware changes will happen, due to our decisions and other circumstances, and it takes bravery to accept that. (2) We have to be brave to accept paths change. Many relationships exist because we go to the same church, school, live in the same neighborhood, or go to the library on the same day. Some may call them relationships of convenience, but what happens when it isn’t so convenient? When you move, change churches or schools, or they open a new library closer to you those relationships can falter. Stepping up to the extra effort needed to continue a relationship takes bravery. (3) We have to be brave to release grudges and see things from the other side. Things will happen. Conflicts will arise. Be willing to work through them, heal with the other person, and allow the relationship to heal as well. If you hold on to that grudge, or refuse to see from their point of view, the relationship will be harmed. Be brave enough to listen with your heart and love fully. Some relationships will end. Whether due to disappointment or changing paths or a falling out there will be relationships in your life which will conclude. To keep these at a minimum I have a few suggestions. (a) Don’t lose yourself. God created you to be a unique individual. He did not create you to become another person. The relationship will be better if two whole individuals take part in it. Be brave enough to let the other person know who you are and accept you. (b) Allow the relationship to ebb and flow like the tides under the full moon. Trying to keep things one way forever will surely only cause heartache. Be brave enough to love the other person through all their seasons. (c) Don’t be scared to walk away if need be. Losing a friend is better than trying to live to please that person. It can’t be done and you’ll both end up unhappy anyway. Be brave enough to know when a relationship costs too much. This isn’t the be all to end all of relationships. Just a few thoughts from someone who has lost friends, had some relationships work out, and learned a lot from books. We are meant for relationship, no mistake, but make sure you have healthy expectations of what they should be like. It takes a brave person to both work on relationships and accept when they have come to an end. Thank you so much for this very timely post. Friendships are my greatetst treasure – and it hurts so much when close ones end. But they’re so worth investing in. Great stuff to help improve my friendships! It does. As I read in a book recently, “Love means you open yourself up to hurt. But it’s worth it.” That’s a really bad summary, so I’m not sure why I quoted it. ROFL Thanks Sharon! Thankful for your friendship, Stacey! ❤ I'm thankful for you as well!